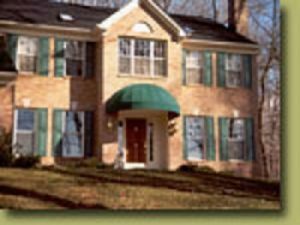 A front door awning will add curb appeal to your home while also protecting it from the harsh weather elements! When people think of awnings, they often think of the ones that cover the porch in your backyard. However, door awnings are also a great, more subtle way to add to your home. If you are looking for a cost-effective way to spruce up the exterior of your home, a front door awning is a great option. Here are some of the advantages of a front door awning. A front door awning will help to protect the front of your home from the harsh UV rays of the sun. This will reduce the amount of heat that enters your home. That means that in the hot summer months, you won’t have to crank up the air conditioning as high, which will save you some money on those costly energy bills. A front door awning can decrease the amount of heat that enters your home by up to 80%. It also blocks the cold air from coming in during the winter months which will reduce your heat expenses as well. An awning protects your front porch and door from the wear and tear that the weather would typically have on them over time. In addition, it will protect you from the elements as well! If you are stuck at your front door trying to find the right key in the middle of a rainstorm, you don’t have to worry about getting soaked. A front door awning will also keep your guests protected from the various elements if they are outside waiting for you to open the door for them. Surprisingly, the sun’s rays are so strong that they can cause damage to your furniture, carpets, and even electronics within your home. Too much sun exposure will eventually cause the color in your carpet or furniture to fade. The heat can shorten the lifespan of your electronic devices. With a front door awning, you are protecting your home from that harsh heat and therefore increasing the lifespan of your valuable belongings. Aside from all of the practical benefits of a front door awning, they simply are nice to look at! With the right awning, you can add a lot of visual appeal to the exterior of your home. You want to pick one that complements and enhances the style of your home. Curb appeal makes your home stand out from the rest in the neighborhood, which adds value when it’s time to sell your home.